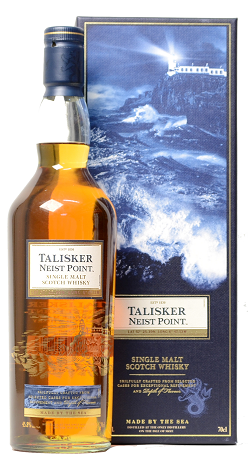 Named after a lighthouse on the Isle of Skye;s westernmost shore, Neist (pronounced "Neest") Point blend of young and older whiskies resulting in a classic coastal-and-smoky Talisker with notes of pepper, vanilla and pear. This Talisker is a new premium no age statement travel retail exclusive single malt whisky which has been bottled at the usual Talisker strength of 45.8% ABV and non chill-filtered meaning the whisky retains it's stunning original colour, aroma and taste! Nose: Immediate traces of peppery spice with maritime notes of brine and seaweed which introduces a sweet, soft malty layer of fresh-baked bread and ripe red fruits. Palate: Well balanced with a soft, smooth texture. Initially sweet then salty and slightly honeyed before giving way to glorious dark chocolate laced with chilli pepper. Finish: Long, warming and unmistakable.